Jeff Drummond at the HIPAA Blog, provides details on a Nebraska case finding that there was no private cause of action for damages under the HIPAA Privacy Rule. In Diering v. Regional West Medical Center, 7:06CV5010 (Sept 15, 2006), the Nebraska District Court citing various other decisions found that HIPAA does not provide a private right of action. The case involved an ER Director who informed an employer who was considering hiring a phyisician about the physician's voluntary drug/alcohol treatment. Like Jeff I have represented a number of health care clients who have been threatened with or had claims asserted against them for violating HIPAA. Most claims have utilized the HIPAA requirements to bolster claims for breach of confidentiality and privacy rights under West Virginia law. I've not seen a pure HIPAA based complaint or demand letter. It will be interesting to watch this area of law develop and mature. It's good to see a summary of cases on this point that I can use the next time this issue comes up. News reports indicate that Robert M. Kolodner, MD, Chief Health Informatics Officer at the Veterans Health Administration, has been named the interim National Coordinator for Health Information Technology for for the Office of Department of Health and Human Services (HHS). Mr. Kolondner will be replacing David Brailer who left the position in May. Click this Google News link for more current information. The Health Information Privacy and Security Collaborative (HISPC) now has its own website through the Agency for Healthcare Research and Quality. The HISPC project is being coordinated by RTI International in conjunction with the National Governor's Association Center for Best Practices. West Virginia is one of 33 states participating in the grant project looking at the variations that exist in each state with respect to privacy and security practices and policies and the legal bases for such practices and policies. The new website allows you to get information and links on the other states participating in the grant project. I've previously posted about the HISPC project here and here. Out of the State of Louisiana, Court of Appeals, Third Circuit, comes a decision examining the release of medical records in light of Louisiana law and HIPAA. The decision, Larry L. Findley, Jr. v. Billie Findley , CW 06-266 (Supervisory Writs from the Fourteenth Judicial District Court, Parish of Calcasieu, No 2004-00401), issued by Judge Michale G. Sullivan affirmed the trial court's denial of a motion to quash and denied the writ. 1) Does this court have jurisdiction to review Sister Depwe’s refusal to produce her records except as provided in 45 C.F.R. §§ 160 and 164? The court found that it did have jurisdiction to address the issues presented under HIPAA. 2) Is Sister Depwe’s refusal to produce the records at issue justified by 45 C.F.R. § 164.524? The court found that HIPAA does not preclude the disclosure of medical information in this case. 3) Does the Health Insurance Portability and Accountability Act (HIPAA ), 42 U.S.C. 1320a-1320d-8, preempt Louisiana law? The court found Loisiana law contrary to HIPAA since a health care provider would find it inpossible to comply with Louisiana law and HIPAA, but also finds that Loisiana law is more stringent because it allows an individual patient greater rights of access to his/her medical records. For more background on the decision read the full opinion. Thanks to Kirk Nahra via the AHLA HIT listserve for alerting me about the decision. For some fascinating facts (blurbs) on the growth (explosion) of the online video market -- courtesy of the likes of YouTube, Google Video and MySpace -- check out Viral Video Chart. Viral Video Chart tracks the world's most talked about videos. Over the last year I've watched with interest the growth of video social networking. I'm amazed by the stats (60,000 new videos uploaded and over 100 million viewed a day) and yet 75% of the people that I talk to have never heard of YouTube. Just amazing what the figures will show as more people explore this type of online medium. Thanks to Denise Howell and Jeff Jarvis for the tip on Viral Video. The most viewed video on YouTube is currently The Evolution of Dance, which was watched by 10 million people during April 2006 and has now been viewed over 30 million times. The guy doing the dance medley, Judson Laipply, is now not merely a motivational speaker from Cleveland, Ohio, but an internet superstar. For just one of the many examples of the creativity being released on YouTube check out this video, "Here It Goes Again". Today's Washington Post article, "Hospital Charity Care Is Probed," provides a summary of some of the findings of the United States Senate Committee on Finance review of nonprofit hospitals. The report findings are part of the ongoing hearings on whether nonprofit hospitals provide sufficient community benefits to justify exemption from federal and state tax. For more information on the Finance Committee hearings and the actual testimony at the hearings check out the hearings website. The hearings website includes the committee member statements and witness statements. Thanks to Michele Grinberg for tip on this article. Today's Charleston Gazette and Charleston Daily Mail business briefs announced the new President and CEO of the West Virginia Hospital Assocation. Joseph M. Letnaunchyn, previously the president and CEO of the Delaware Healthcare Association, will start in November. Mr. Letnaunchyn replaces Steven Summer who resigned this summer to take a similar position with the Colorado Hospital Association. Like Dave Winer I recently broke down and purchased a Blackberry to replace my aging cell phone. I've been taking Winer's News River feeds for a spin and find them user friendly and valuable to check in on the BBC and NYT news. However, in all the buzz about the River feeds I've seen little discussion on Bloglines Mobile and how it differs in application. I use Bloglines as my RSS reader of choice and I added the mobile version to my Blackberry. I've been very happy having the mobile version available to check feeds. There are a couple of annoying features that I have come across -- but otherwise it looks and operates great. I think both are valuable tools for mobile news consumption -- and they are suited for different purposes. Doc Searls hits on some good points about getting the publishing world to focus more on the needs of mobile cell phone news junkies. My Bloglines Mobile contains the specific information that I want pushed to me to monitor, review and read. For example, I've set up news feeds to monitor particular news topics on clients that I do work for. I can use it to quickly monitor without wading through all the other news. Plus, the news isn't just from the NYT or BBC. On the otherhand, there are times that I just want to scan the news -- like looking through the local paper every morning. I not particulary interested in any specific item. My analogy building off a quote of Dave Winer in a post by Kevin O'Keefe. Somedays I like to stand around on the bank all day long and watch all the boats go up and down the River -- but other times I only want to be alerted to specific ones (like the Delta Queen). I want to know when she is coming along so I can run down to the bank, watch her and hear her calliope. UPDATE: A new feature added to Bloglines Mobile to make reading your favorite feeds easier. Bloglines has integrated Skweezer technology that optimizes web pages for use on mobile devices. I haven't had much of chance to try it out but I look forward to using the feature. Two interesting posts crossed my RSS feed this morning that I thought I would tie together in a third post. The first from Lee Kraus blogging over at Learning & Technology mentioning a recent Jeopardy episode where Alex said, "download a file and load it on an Ipod. . ." Response by the contestant, "What is a podcast?" The second by Kevin O'Keefe at Real Lawyers Have Blogs who admits that he has been on Seinfeld rerun and was watching the episode where Jerry says, "what the hell is email?" Both posts provide a perspective on how new technology often gets introduced into mainstream society. The posts started me thinking about the following questions. What TV show or movie first introduced the cell phone? Has RSS been mentioned in a TV show or movie? Has a blog been incorporated into a TV or movie plot? Extra credit question: Who created Jeopardy? Answer. The West Virginia Chamber of Commerce issued its Policy Recommendations for 2006-2007. The twenty-nine different policy recommendations were developed by the Chamber's committees and adopted on August 29 by the Chamber's Board of Directors. Included in the announcement are several health care related policies including: Decreasing The Prevalence of Unisureds, Expanding Health Insurance Availability, Health Care Funding and e-Health Technology. On August 29, 2006, Governor Joe Manchin signed Executive Order No. 6-06 authorizes the state's Chief Technology Officer and Chair of the West Virginia Health Care Authority to oversee the implementation of additional privacy and security policy for state government. The goal of the executive order was to acknowledge and build on the state's continuing efforts to maintain a high level of information security and enhance the protection of private information. The Executive Order requires the development of privacy and information security principles that will guide government agencies in their daily efforts to protect citizens' personally identifiable information. Sonia Chambers, Chair of the West Virginia Health Care Authority will be responsible for protecting the privacy of confidential and personally identifiable information collected and maintained by Executive Branch agencies, while the West Virginia's Chief Technology Officer, Kyle Schaffer, will be responsible for information security for all Executive Branch agencies. The Order also requires the development of privacy and information security programs and teams comprised of representatives from all Executive Branch department-level organizations that will develop and implement new policies and conduct audits of agency privacy programs. Photos from the 2006 Charleston Regatta Anything That Floats Race. My favorite entry were the employees from Kid Country Toys. They didn't know whether the Black Pearl would sail or sink -- but sail it did down the Mighty Kanawha. We live only a few blocks from the boat launch and our family hasn't missed this the last couple of years. The best part are the skits that recount the antics and history of the Kanawha River Navy. All the entrants seem to be known for their bribery of the judges. 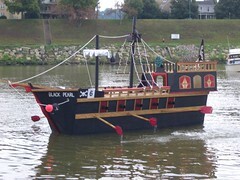 Although the Black Pearl was the best floating entry -- my vote for best skit went to the Shadys Meet the Bradys. Where the WV family met the Brady Family and the curse of the VW. While preparing this post I quickly googled the Kanawha River Navy and came across the group's website, including some great photos from last year's event. Below are some more photos that I took along with a link to my Flickr photos with a few more.